Most animal cells release materials into the extracellular space. The primary components of these materials are proteins, and the most abundant protein is collagen. 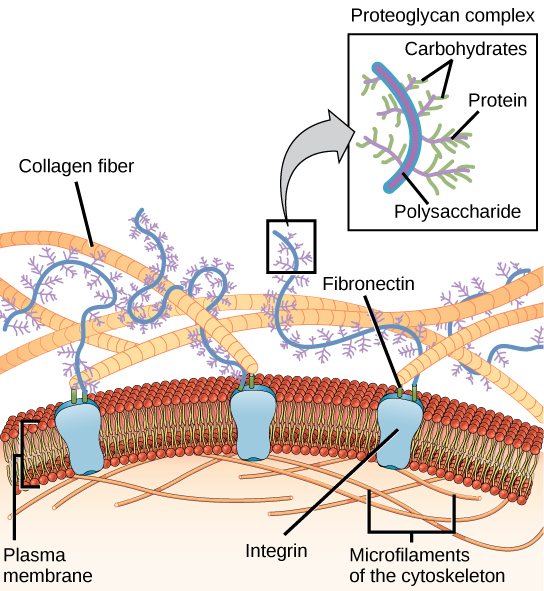 Collagen fibers are interwoven with carbohydrate-containing protein molecules called proteoglycans. Collectively, these materials are called the extracellular matrix ([link]). Not only does the extracellular matrix hold the cells together to form a tissue, but it also allows the cells within the tissue to communicate with each other. How can this happen? 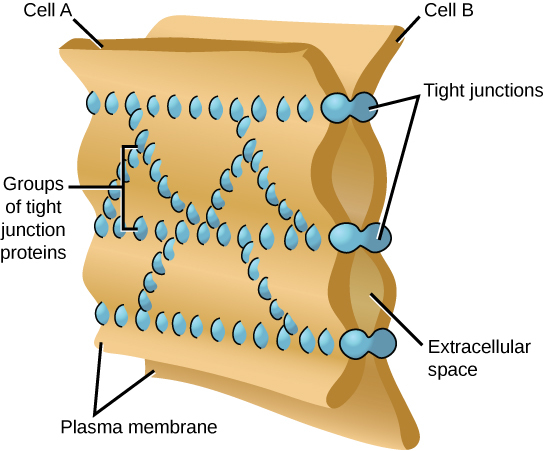 In general, long stretches of the plasma membranes of neighboring plant cells cannot touch one another because they are separated by the cell wall that surrounds each cell ([link]b). How then, can a plant transfer water and other soil nutrients from its roots, through its stems, and to its leaves? Such transport uses the vascular tissues (xylem and phloem) primarily. 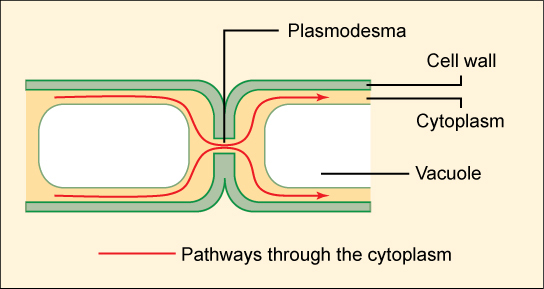 There also exist structural modifications called plasmodesmata (singular = plasmodesma), numerous channels that pass between cell walls of adjacent plant cells, connect their cytoplasm, and enable materials to be transported from cell to cell, and thus throughout the plant ([link]). A tight junction is a watertight seal between two adjacent animal cells ([link]). The cells are held tightly against each other by proteins (predominantly two proteins called claudins and occludins). Also found only in animal cells are desmosomes, which act like spot welds between adjacent epithelial cells ([link]). 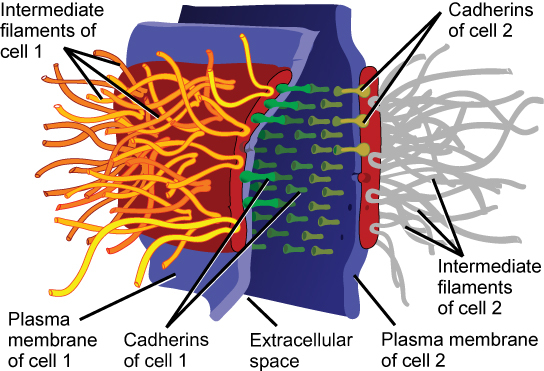 Short proteins called cadherins in the plasma membrane connect to intermediate filaments to create desmosomes. The cadherins join two adjacent cells together and maintain the cells in a sheet-like formation in organs and tissues that stretch, like the skin, heart, and muscles. 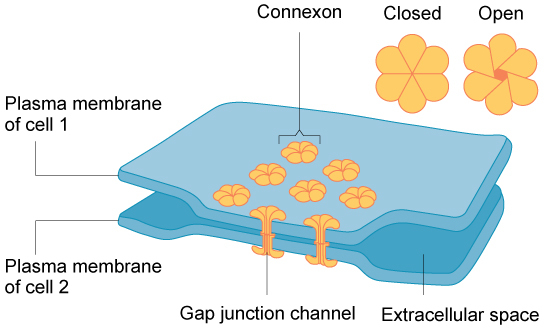 Gap junctions in animal cells are like plasmodesmata in plant cells in that they are channels between adjacent cells that allow for the transport of ions, nutrients, and other substances that enable cells to communicate ([link]). Structurally, however, gap junctions and plasmodesmata differ. 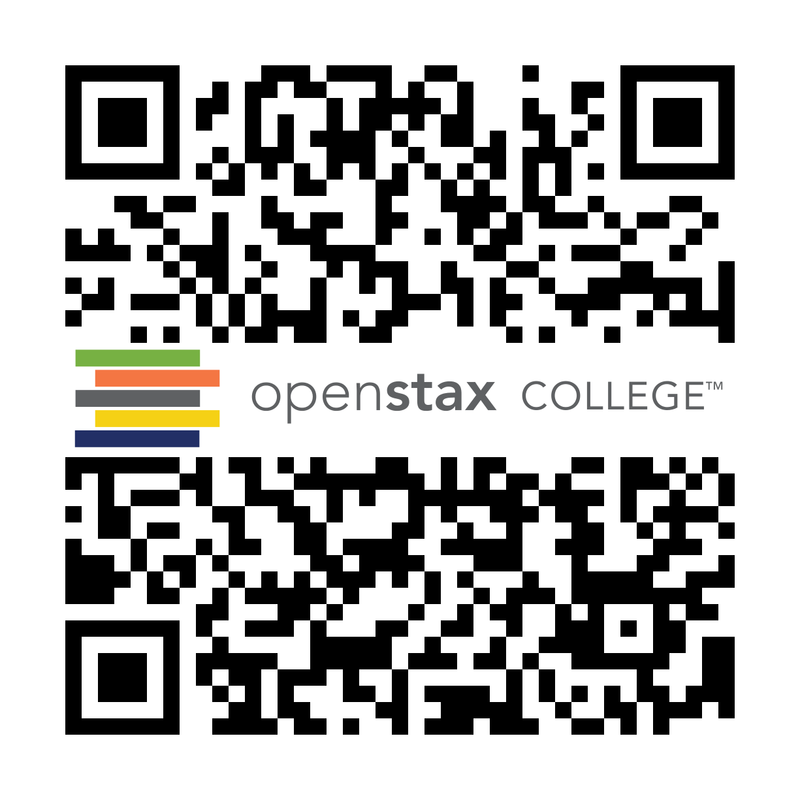 Connections between Cells and Cellular Activities by OpenStaxCollege is licensed under a Creative Commons Attribution 4.0 International License, except where otherwise noted.